H.A.P.P.Y. Simple Solutions is a small, family owned company created to serve the niche personal care needs of our unique customers. What started out as a mom's desire to help her allergy challenged toddler during playtime has now become a business that serves special needs families, athletes, and thousands of fellow moms. J. Kelly Mayes is the mom who got it started, but the business only exists because of the loving support and tireless work of her sisters Terry & Teri, her mother "La-La" (who spends hours picking out quirky stitches), endless creative ideas from her son (the original user of Sniffle Buddies), patience and loving support from friends and family, and brilliant contributions from PT's, OT's, parents, fellow inventors, customers, & critics. We are grateful to be able to create "for you"! You can purchase any or our H.A.P.P.Y. 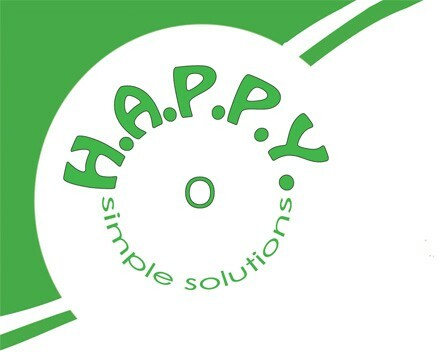 Simple Solutions products here on our website or visit us at the Los Angeles or San Jose Abilities Expos. Although the original product, Sniffle Buddies, has been sold nationally and internationally, we have taken on a more personal approach with our recent products, including the Rogey clothing protectors, BandjO bamboo wristbands, and Custom items. Feel free to contact us directly or check out a select list of boutiques who are partnered in offering our unique products. My son, 7, who has Down syndrome is non-verbal. He has gotten int the habit of signing "more" incorrectly. Rather than touching his fingertipes together, he digs his fingertips into his wrists, resulting in cuts and scars. We have used band-aids, gauze wraps and other medical types wraps. That is, until now. The Sniffle Buddy is a God-send. He does not try to remove it and it really does the trick. It protects his wrists from injury while we are working with him to sign properly. I cannot thank you enough! Pamela - Director at Buddy Cruise, Inc. Thank you again for the custom clothing protectors that are so helpful in taking care if Diana’s unique needs. The special fabrics add cheer and fashion to her unique challenges. The Diana Head Band is also helpful and very touching that you created it for her. I will be sure to let the therapists and doctors know. Susan - Mom of Diana - "The Diana Band"